CUESA culinary intern, Mark De George, wrote this week’s feature. Historically, the egg has heralded the arrival of spring. Hens lay fewer eggs in the winter when days are short, and egg production begins to steadily increase as the days lengthen. Although artificial lighting in most large-scale egg production facilities has eliminated seasonal fluctuations in egg laying, eggs are still associated with spring traditions in many cultures around the world. Over the past fifty years, the egg has gotten a bad rap because of its high cholesterol content being linked to coronary heart disease and other medical conditions. Today, however, egg lovers can rejoice—egg consumption is on the rise. The ovum is back and better than ever. Why? Recent scientific studies have determined that the dietary cholesterol found in eggs isn’t as bad as originally thought. In fact, it has been shown that eggs actually raise “good” blood cholesterol levels. With that in mind, get a couple of eggs and scramble to your heart’s content. Eggs are portable, versatile in preparation, and can be eaten at every meal. The egg, including the separated yolk and white, serves many important roles in cooking. Whole eggs are used to bind ingredients, such as in meatloaf. When used as a glaze, beaten eggs provide sheen to baked goods. Egg yolks thicken custards and provide the base for emulsions, such as mayonnaise and hollandaise sauce. Beaten egg whites give lift to many dishes, such as soufflés and sponge cakes. The proteins in egg whites also clarify stocks. There are a dizzying number of terms on egg cartons these days. What do they all mean? Although the U.S. Department of Agriculture (USDA) offers trade descriptions, poultry farms are not required to adhere to labeling standards. Below are some general definitions of the terms. Cage-free: Hens live without cages in indoor floor facilities and do not necessarily have access to the outdoors. The amount of space per hen varies by producer. Fertile: These eggs come from hens that live with roosters. Most are cage free. Free-range (free-roaming): Hens have access to the outdoors, but for an undetermined period of time, and may be, but generally are not, raised outdoors. Hormone-free: The use of hormones in laying hens was banned in the 1960s. Organic: Hens are given only certified organic vegetarian feed without pesticides, fungicides, fertilizers or antibiotics. Hens have access to the outdoors. Organic chicken operations must be certified by designated agencies. Pastured: Hens are raised outdoors on pasture, usually using movable enclosures (hens also have access to a coop for shelter and egg laying). 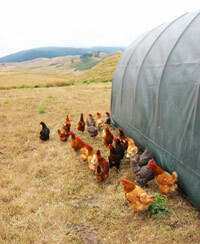 This enables hens to eat a variety of natural foods, such as different grasses, seeds and insects. Some scientific evidence indicates that, because of this diet, eggs from pasture-raised hens have less cholesterol and fat, higher omega-3 fatty acids, higher amounts of lutein, beta-carotene and vitamins A & E.
Vegetarian: Eggs are produced by hens whose feed is free of animal by-products. One 75-calorie egg provides 6 g protein, 5 g fat, 0.5 g carbohydrates and 190 mg cholesterol. 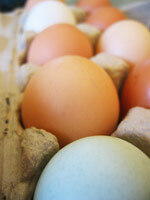 Eggs are rich in vitamins A, B, D and E, as well as omega-3 fatty acids and lutein. Almost all nutrients come from the egg yolk. Egg yolks are one of the richest sources of riboflavin, vitamin B12 and choline, which may reduce age-related memory loss and prevent birth defects. Egg whites are made up of water and protein and contain no cholesterol. Some egg producers are enhancing the nutritive qualities of eggs with feed supplements. Choose eggs with no visible cracks in the shell. According to the USDA, eggs should be used within three to five weeks after the “sell by” date on the carton and stored in their original packaging. Egg whites can be frozen for up to a year and hard-cooked eggs will keep for a week under refrigeration. Egg yolks do not freeze well. Happy Quail Farms also sells an occasional dozen. Everything Under the Sun sells Eatwell Farm’s eggs on Tuesdays.